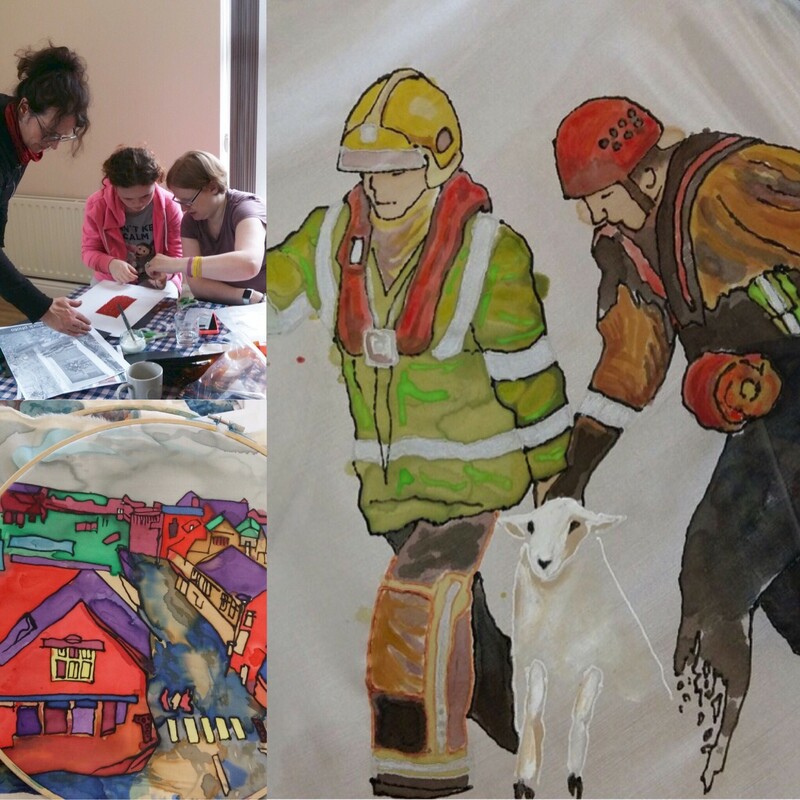 We are now five months into our Kendal Flood Tapestry Project and we always get something new from every session. 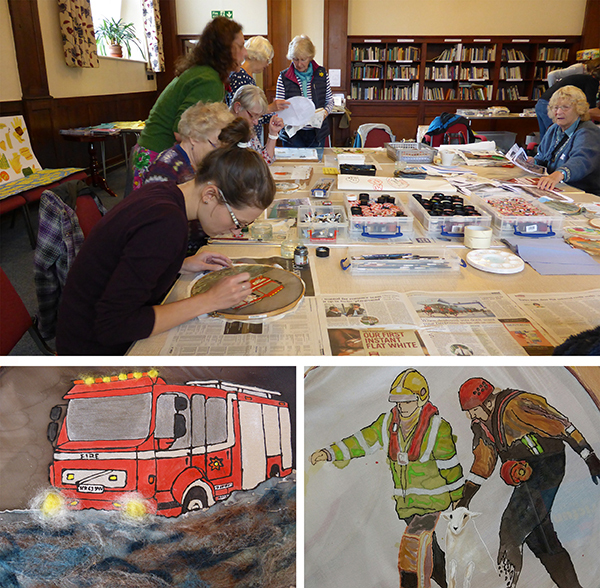 Today we were back at Sandylands, in one of Kendals flood affected areas, with our latest community workshop. Artist Donna Campbell read a very thought provoking and powerful poem, written within the first 24 hours of the floods. It took us all back to the sights and sounds that dominated the town and countryside at the time. We each shared a recollection of the floods; how strange it was at night seeing no lights on in the houses apart from the strange glow from dehumidifiers. Another person told us how Christmas just didn’t happen, it’s the only time she’s not celebrated Christmas. People who were unable to be rehoused with their dog, stayed put so they could be together. With our memories evoked and a stack of materials to rival that of any artists studio we set about creating. Whether it be in stitch, fabric paint, tracing over photographs, collage you name it, there was someone doing it. 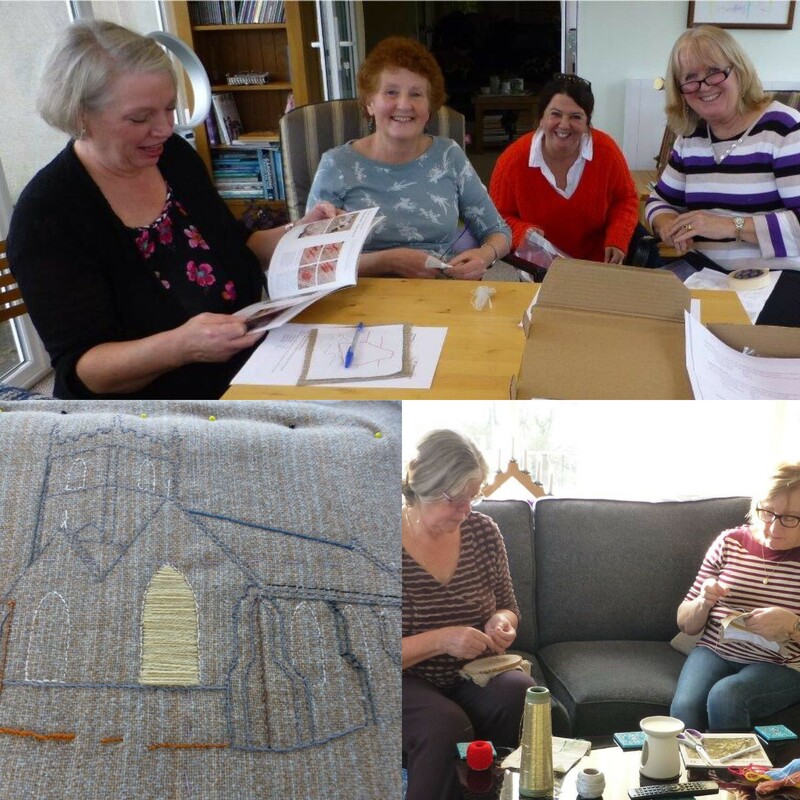 New stitches were learnt and various techniques brought to life the images of resilience of the people of Kendal. I silk painted a man delivering tea, from a tea pot no less, through flood waters to desperate stranded residents. So often in our lives a cup of tea can make all the difference and I’m sure the four or so cups contained in that humble teapot made a few peoples day a bit brighter. Acts of friendship, heroism and selflessness prevailed during and after the floods. Peoples pets were rescued in canoes to the farmers who drove through the flood waters rescuing vulnerable residents from their homes. There was support, encouragement and smiles, along with tea and crumpets, on offer to nourish our creativity and in less than an hour we had all produced something to feel proud of. It’s never too late to get involved, this is a community project which means we are geared up for people dropping in, even to only do half an hours participation (which may even be to tell a story rather than pick up a needle). It’s whatever you want it to be, it’s a tapestry for the people of Kendal, by the people of Kendal. Further details can be found on our website. Alternatively please contact bridget@quaker-tapestry.co.uk or phone 01539 722975 if you would like to get involved or be added to our emailing list.